Of all countries I thought I would never visit, Moldova was on the top of my list. That is probably because I didn’t know it existed six months ago, but mostly likely because I simply didn’t know anything about the country even after I knew it existed. For all of you in my boat, I can now enlighten you. 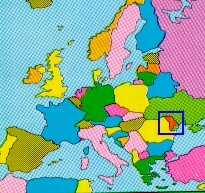 Moldova is a small post-Soviet state bordering Southwest Ukraine. It is known for its good wine and speaking a close descendent of the Latin language. It will forever be remembered in my mind as the land that looks like a snow covered Napa Valley on the Moon. 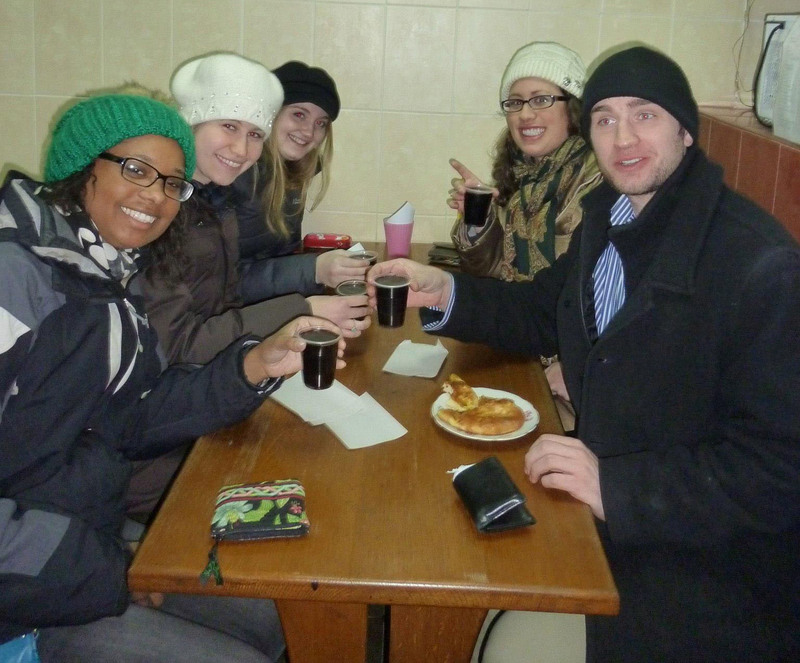 For the past Month, Peace Corps Ukraine has been sending Group 42 Volunteers (my group) and extending volunteers on a week long excursion to Moldova to get new Ukrainian visas. Our new visas will be registered with the minister of interior in contrast to our old visas that were registered with the minister of foreign affairs. 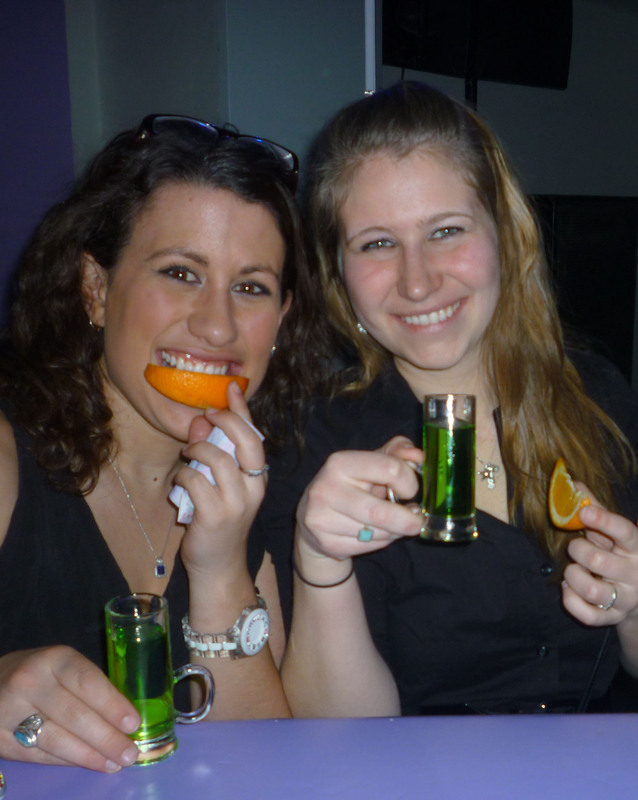 We needed to leave the country to do this and Moldova turned out to be the most accommodating option. Maidan Nazalezhnosti or Independence Square in Kyiv. Location of the Orange Revolution protests in 2004 and current shopping hub. 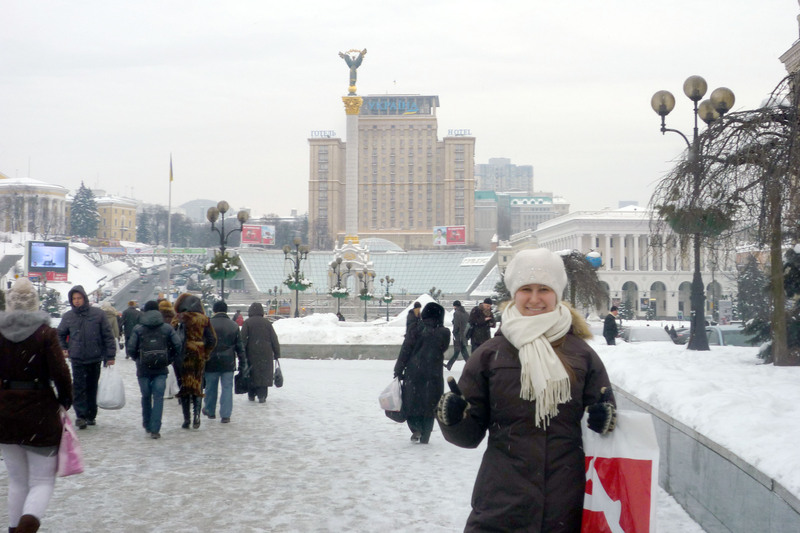 Since we set off from the capital, Lauren, Sarah and I decided to extend our trip and spend the weekend in Kyiv. We found a great hostel called “The Hub” close to the center of the city. 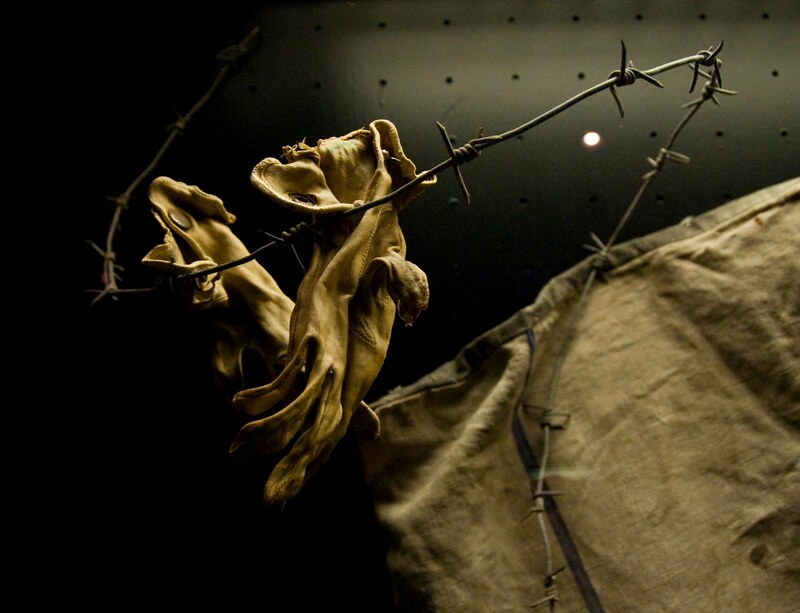 We visited the famous Great Patriotic War (WWII) Museum, shopped on Kreschatik Street, feasted on street side Shwarma stands and meandered about Independence Square. We learned about underground soviet rock bands from Ukrainian friends at the hostel, saw Nazi gloves made out of human skin at the WWII museum as well as a machine that ground up human bodies into fertilizer, mastered the Kyiv metro system, froze, ate at a delicious Crimean Tartar restaurant, and found multiple Spanish stores with great sales. 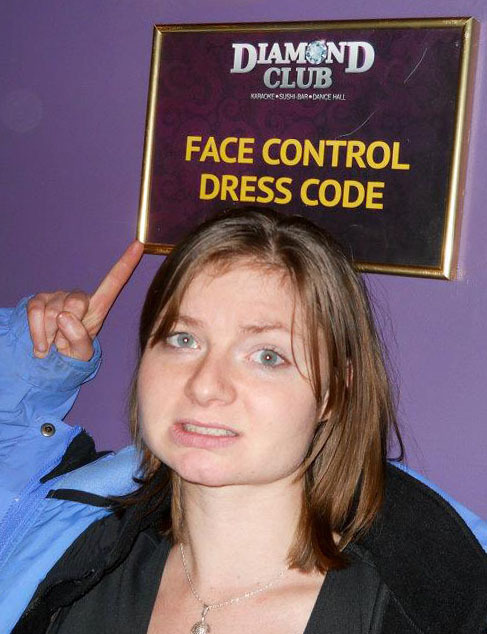 We even made it into one of Kyiv’s exclusive night clubs that boasts strict “face control” (granted it was a Sunday night). Click HERE to see Vopli’s version of Hotel California. Our journey to Moldova started with a 17 hour over night bus ride. After a few benedryl and a hearty meal at a truck stop restaurent entitled “Borscht“, I was able to sleep a few disjointed hours on the bus. 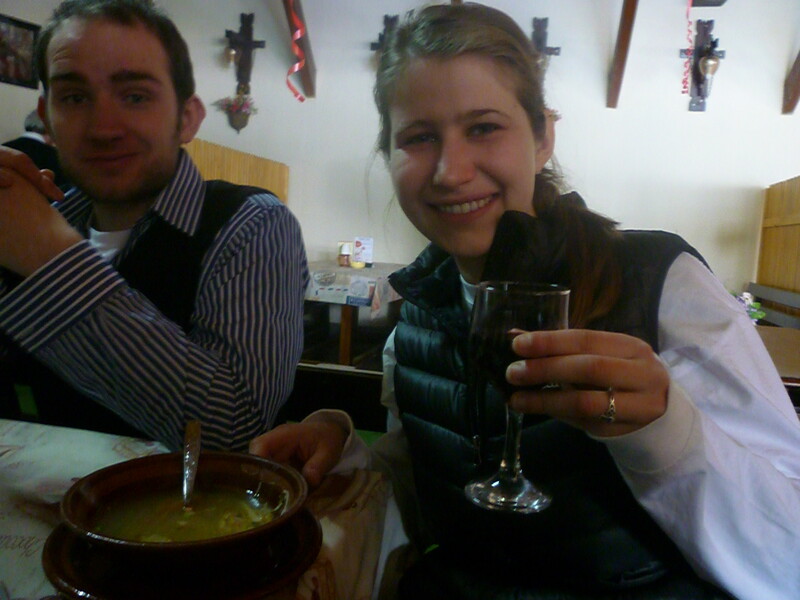 When we arrived in the capital of Moldova, Chişinău, the biggest struggle was to decide to take a nap or sprint to the closest restaurant to get some food and wine. I chose the wine…It was delicious. We were given an extrodinary $60 per dieum for our time in Moldova, about 1/3 of our monthly living allowance in Ukraine. I was able to save some, but spent the rest on food, wine and souvenirs. Highlights of Chişinău included a visit to “Mall Dova” (one of the worst play-on-words I’ve laughed at), super market #1 which sold the treasured hot sauces, peanut butter and spices that are extremely difficult to find in Ukraine, the Elephant Bar, and souvenir bazaar were we made friends almost as fast as we could buy painted eggs. Oh yes, and we went to the Ukrainian consulate and got new visas! Bought this man's hand painted eggs. He was so friendly and gave us all big kisses when we said goodbye. I also celebrated by 23rd birthday on Wednesday. It was probably the most unique birthday location I’ve celebrated in and I missed sharing it with my BFF Lauren Sjoreen, but it was nice to be around other Americans. Birthday party at the Elephant Bar with homemade Wine, Placinta, Cynden, Lauren, Virginia & Derek! The ride back to Kyiv only took about 14 hours then another five hours back to Romny on a marshrutka. My site mate and I celebrated our safe arrival with a bottle of Moldovian Wine and Jon Stewart. However, my mood was slightly dampened when I learned that my school will have classes on Saturdays for the next five weeks! Apparently the ‘heating season’ ends April 15th and our school will save money if we close school for two weeks before this date. Since this is normally the time of Spring Break, it is not a big deal, but we do have to make up for the break being two weeks instead of one…hence, school on Saturday for five weeks. 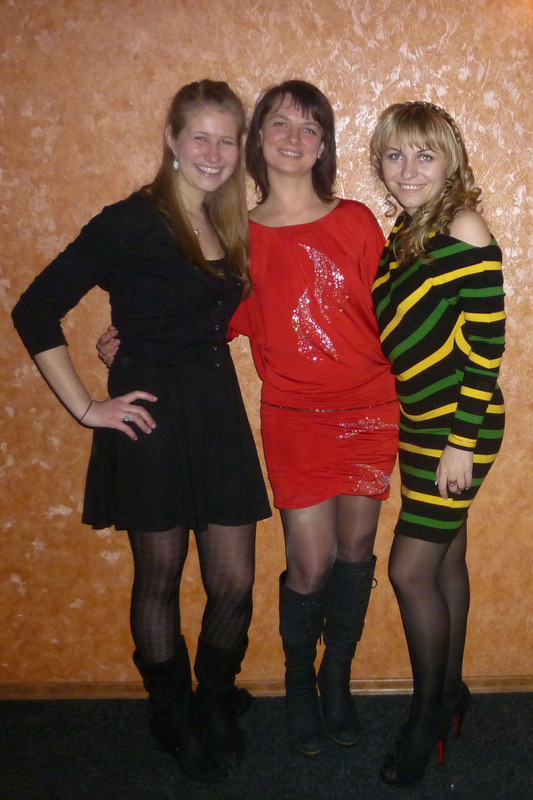 Me, fellow English Teacher Tanya and my counterpart Lesia at Lesia's 30th Birthday party three weeks ago. When I returned to school on Saturday, my fellow English teachers surprised me with a beautiful birthday card and gift of a frying pan. This is probably one of the most practical presents I’ve ever received and I was thrilled since my current pans literally light on fire when I cook in them. Its good to be back home in my cozy flat. However, I am also coping with the sad fact that this might not be my home much longer. 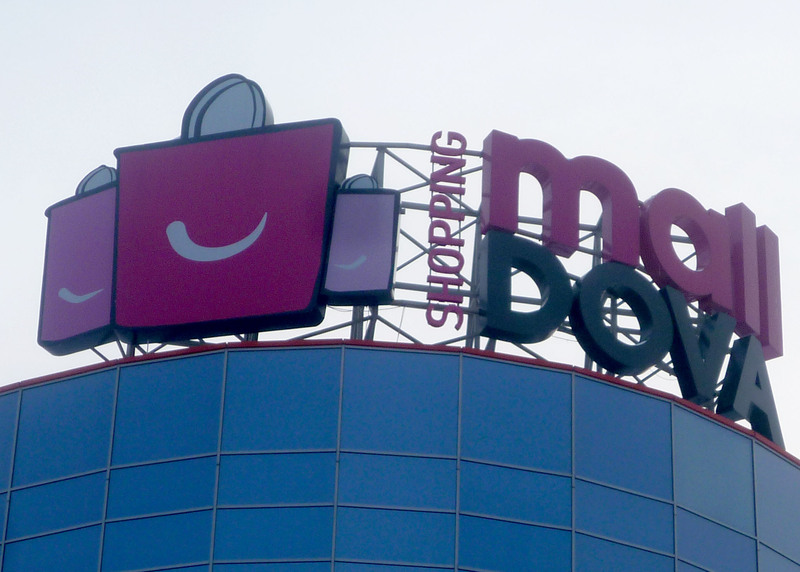 The new Visas we received in Moldova are only a temporary fix and only last for 45 days. During this time we need to apply for another one and the paperwork I must fill out requires everything from a copy of my school director’s personal passport, hours of strife for my counterpart, to my landlord traveling to the Oblast center 2 hours away to claim me as her tenant. The main problem arises with this last requirement because many landlords refuse to comply with the various stipulations that are necessary. If this is the case with my landlord, I need to find a new place to live, mostly likely with a co-worker. However, this would actually be a blessing in disguise, since it would undoubtedly improve my Russian skills and I’d have another Ukrainian family. The only downfall is that it would severally limit my privacy. 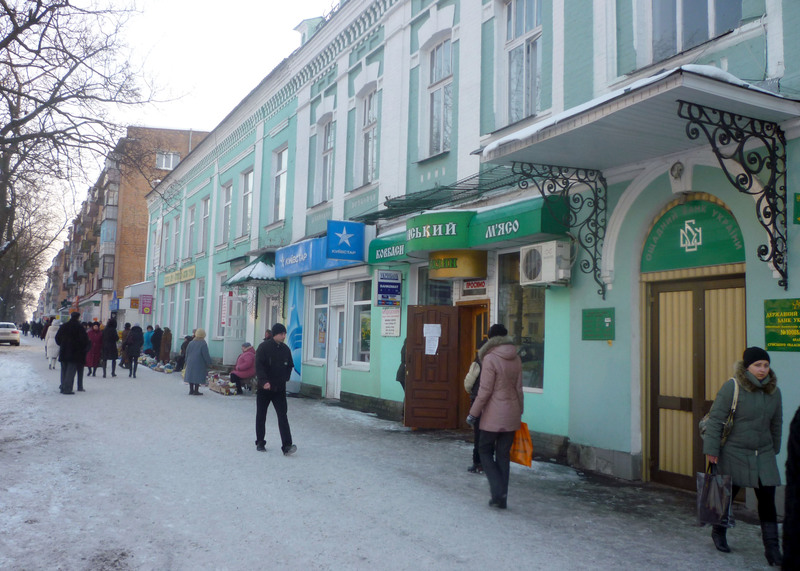 Main Street of Romny, about a block from my flat. 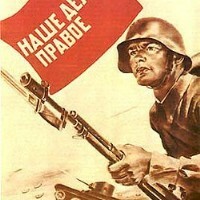 Today, many Ukrainians will celebrate the former Soviet Army Day or Men’s Day. 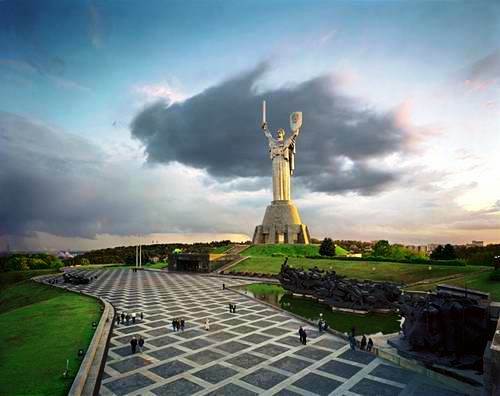 It commemorates Russian soliders who have fought to defend their motherland from ancient times until today. Military men celebrate by exchanging words of congratulations and women celebrate by appreciating the men in their families. блинчики/Pancakes symbolize the sun on Pancake day. This Monday will be the first day of Pancake Week (Масленица)! It welcomes the spring, says farewell to the winter and is celebrated the week before the fasting season of Easter. Rumor has it, Romny will celebrate by burning a straw doll symbolizing winter and having a pole climbing contest. The winner gets a prize at the top of the pole, it could be Salo or it could be a live chicken. 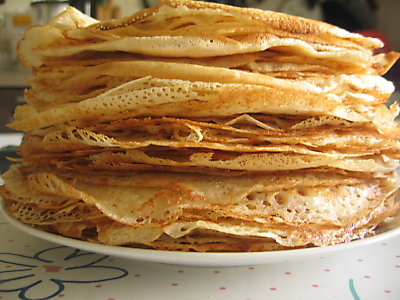 Ukrainian pancakes are thin (Similar to Mrs. Sjoreen’s delicious thin pancakes, if you’ve ever had them) and can be eaten with everything from meat to cheese to honey. However, unlike the US, Syrup is never used. 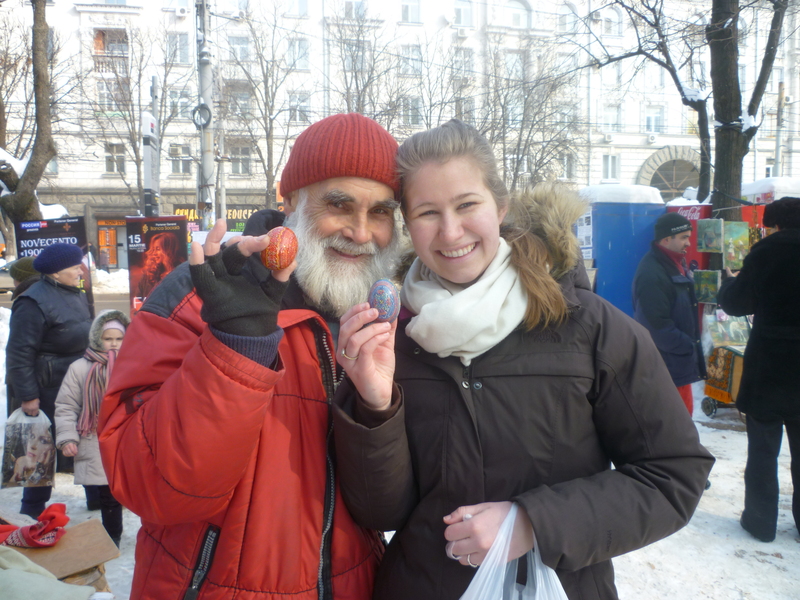 Now I know two things about Moldova: the people there have a great sense of humor and that is the place where Santa hides during the year (selling painted eggs on the streets). I WANT A NEW POST! This seems to be my only source of actual reading so you’re making me more stupider (haha yes, I just did that) by not keeping me updated on a regular basis. Katherine I’m so glad Google led me to you, and I’m so sad I found it so long after you started. Project for the week. Read all posts. This is better than “Monique and the Mango Rains.” And I LOVED that book! You write so well! I am a huge fan of those Crepe looking things. They have so many names (i.e. Swedish Pancakes) lol. Like snow in Alaska.